If you’re fresh out of ideas, 5 On Your Side has put together a list for you and your sweetheart! 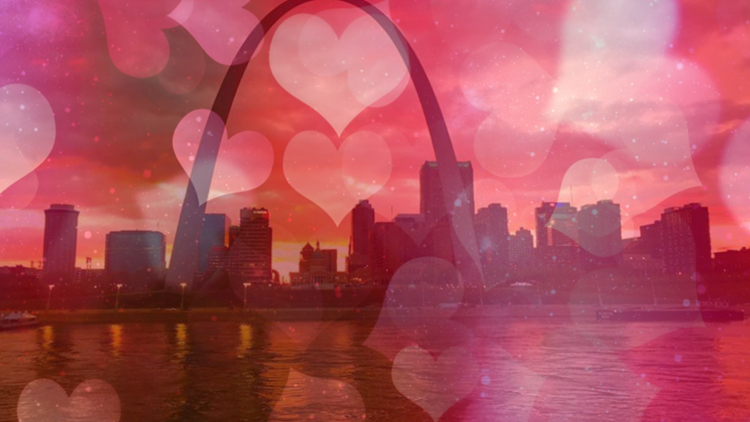 ST. LOUIS – It's Valentine’s Day and if you haven’t made any plans, you might want to get on it. And if you’re fresh out of ideas, 5 On Your Side has put together a list for you and your sweetheart! Join Juniper for your Valentine’s celebrations Feb. 14 through Feb. 16 and enjoy a five-course prix fixe menu highlighting select southern specialties and vegetarian options. Executive chef Glenister Wells’ 5-course dinner will cost $65 per person, and guests are invited to add curated wine pairings to each course for an additional $35. A limited version of Juniper’s regular menu will still be available a la carte. Guests can enjoy a four-course dinner from acclaimed Chef David Burke for Valentine’s Day and the restaurant will even take care of the flowers. For $75 per person, diners select: a choice of appetizer of Braised Pork Raviolo with Taleggio, basil and stewed tomatoes; Tomato Gnocchi and Crab with salsa verde and Marcona almonds; or baked Oysters with yellow pepper, garlic chips and tobiko. The next course includes a choice of soup or salad of: Little Gem and Beet Salad with Marcona almonds, horseradish and yogurt-beet dressing; Lobster Bisque with cappuccino foam and basil oil; or Strawberry Salad with Pecorino, frisee and sunflower seeds. The choice of entrée includes: Grilled Filet Mignon with white cheddar mashed potatoes, peas and mushrooms (option for a lobster supplement for $25); Seared Salmon with butternut farrotto, asparagus and brown butter; or Pan Roasted Chicken with broccoli, sofrito and polenta. For a decadent dessert, choose between the Chocolate Peanut Butter Mousse “Radio City Rockette-style” with raspberry sauce; Passion Fruit Mousse with spice chili and chocolate center, glazed with Valhrona white chocolate; or Gooey Butter Donuts for Two with gooey butter sauce and cotton candy. Enzo Cake, a heart-shaped chocolate almond cake is layered with raspberry caramel, crispy hazelnut, and milk chocolate Chantilly cream (serves 4-6, $35). Pavlova Heart, made with strawberry-lychee compote, elderflower Chantilly, and meringue ($32). Ruby Cake, a dark chocolate cake layered with raspberry compote and enveloped by a decadent chocolate-raspberry tea mousse ($32). Chocolate Vanilla Bean Truffles (12 pieces, $9.50). Milk or Dark Chocolate Dipped Long Stem Strawberries (6 piece or 12 piece, $21 or $39). Available for pickup on Tuesday, February 12 through Thursday, February 14. Fondue Kit for Two with house made chocolate ganache and bite-sized brownies, cookies and financier for dipping. Valentine’s Day Macaron Box including raspberry, sambava, poppy flower, ruby, vanilla bean and strawberry macarons (6 or 12 piece, $11.50 or $22). Eclipse Restaurant will be offering a special Valentine's Day menu on the nights of Feb. 14, 15 and 16. After dinner and drinks, why not take your partner up to the rooftop for a little dancing? Moonrise will have a DJ spinning sweet, sweet music for all you lovebirds to boogie to beneath our spinning moon. Golden Pear is crafted with puff pastry, walnut frangipane, jasmine spiced pear and toasted walnut crumble. Floating Grasshopper highlights creme de menthe mousse surrounded by a chocolate shortbread cookie on cardamom anglaise and topped candied mint garnish. The Lovers' Plate is a sharable platter of the restaurant’s most popular desserts, designed for two. The restaurant is located on the upper level of 1915 Park Avenue above POP. Cardinals fans can celebrate at Cardinals Nation with brunch on Feb. 10 from 10 a.m. to 2 p.m. It’s $35 per person and includes free admission to the Cardinals Hall of Fame and Museum. Enjoy a special Valentine's menu and one complimentary Mimosa or Bloody Mary. On Feb. 14, enjoy a romantic dinner for two from 6 p.m. – 10 p.m. dinner is $90 per couple and includes two appetizers, two entrees, one dessert and a bottle of wine. Wine and craft beer with chocolate pairings, owl prowl hike and a photo Booth with Barn Owl photo opportunity. Wear comfortable shoes and warm clothing for the short night hike at the end of the evening. Proceeds benefit over 200 permanent animal residents and the future of injured birds of prey. Order your Valentine a puppy gram from the Gateway Pet Guardians! For a $100 donation they’ll deliver a flower along with puppy snuggles to your Valentine! Each puppy stays at the destination about 10-15 minutes, just enough time for everyone to inhale some puppy breath and get some cuddles! No, you can’t keep the puppy unless of course you want to adopt him! Orders must be placed by Feb. 8. For more information, click here. Cedar Lake Cellars will also have a sweetheart brunch on Feb. 17. You and your sweetheart will enjoy a delicious brunch for $28.99 per person. The price of brunch includes one glass of mimosa, champagne, sangria or Cedar Lake Cellars wine! 'Valentine's All-Stout Tap Takeover' at Perennial Artisan Ales, click here for more information. Blueberry Hill will have Karaoke with Kj Sheel and it’ll feature only love and break-up songs on Feb. 14. It’ll be in the Elvis Room and starts at 8 p.m.
Cupid shuffle at Cedar Lake Cellars! Grab your friends and join us for our Valentine’s Day Cupid Shuffle in The Barrel Room on Feb. 16! You’ll enjoy music, games, contests, fire pits, a photo booth and more! The party starts at 6 p.m. This is a free and open event – walk-ins are welcome. There’s also a Cupid Shuffle dance contest. instructor-led axe training, open axe throwing, unlimited laser tag, virtual reality and you can even tackle their high-ropes course and let the good times roll in human hamster balls. Drink specials from 5 p.m. to 6 p.m. keep your eyes peeled for Cupid, after all he needs more target practice too! Head out to Hidden Valley to ski and tube! The ski resort is open from 1p.m. to 9:30 p.m. and the polar plunge tubing park is open 5:30 p.m. to 9 p.m.